A comprehensive metadata scheme for distributed geographic information services should include multiple types of information services, including geodata objects, software components, and web map services. 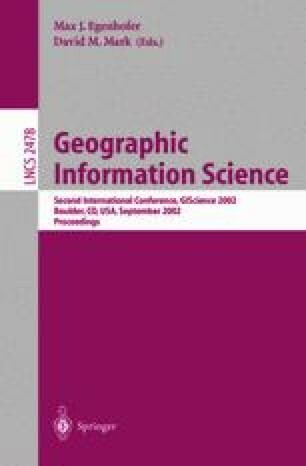 This paper examines the existing metadata standards and their implementation frameworks and presents an operational, object-oriented, hierarchical metadata architecture as an alternative solution for searching, indexing, and retrieving distributed GIServices on the Internet. An operational metadata framework can facilitate the establishment of self-manageable, self-describable GIS web services, which can be freely combined and used on the Internet. Hierarchical metadata repositories can provide a meaningful metadata archive structure and can improve metadata search mechanisms, where geospatial datasets and services are grouped and organized by their unique features or functions. By collaborating with operational metadata contents and hierarchical metadata repositories, the new metadata framework will help users and systems to access on-line geodata objects, software components, and web map services efficiently and effectively.